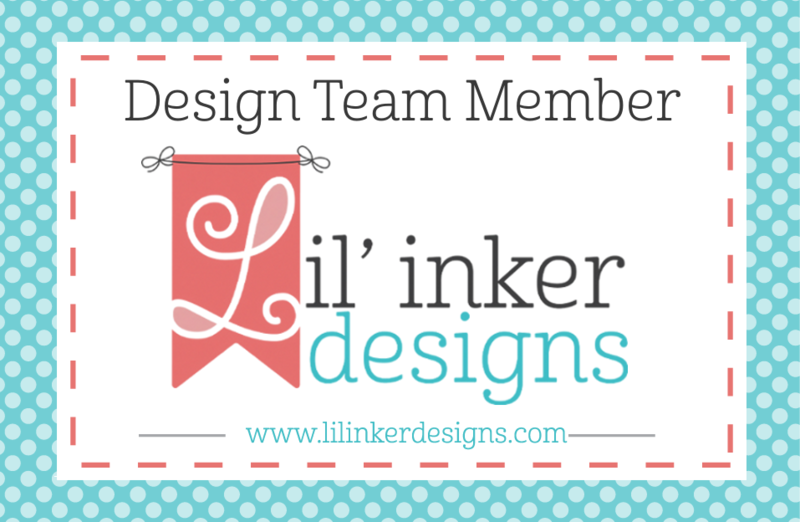 Lil' Inker Designs has an awesome mini release! We are showcasing some of these products with a blog hop. 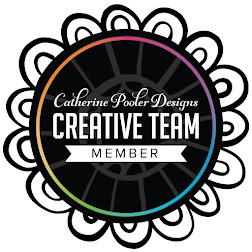 You should have arrived from the talented Laurie Willison's Blog. My first project features three products that were meant to go together, the CoverUp Die: Stitched Clouds and Angel Pets Stamp Set and Angel Pets Die. I started with a white card base that was inked with distress oxide and distress ink and then sprinkled with water, and embossed with the CoverUp Die: Stitched Clouds. I then stamped, and die cut the cute pup and wings (separate, so you could use the dog alone!) from Angel Pets Stamp Set and Angel Pets Die. I adhered the pup in front of a rainbow die cut from an older die set, Rainbow and Clouds Die Set, onto a white square die cut from the Stitched Mats: Dual Stitched Squares. The sentiment from Angel Pets Stamp Set was stamped onto a panel die cut from Stitched Mats: Long and Skinny Rectangles. 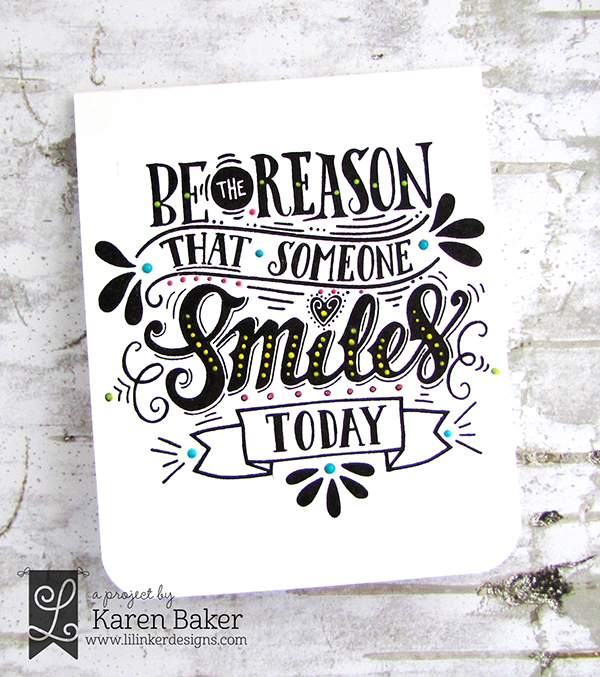 This next card features one of the two sentiment stamp sets released, Be the Reason Someone Smiles Today. I stamped the large stamp onto a white cardstock base with rounded corners. There are many reasons to customize this stamp set, but I chose to use Nuvo Drops for embellishments. It is with pleasure that I get to send you to the talented Nichol Spohr's Blog as the next stop along the hop. I hope you get a chance to visit the Lil' Inker Design Store now as all the NEW mini release products are already up at the store! Don't forget to leave a unique comment along the each of the stops on the hop! Laura, the amazing owner, has decided the one of everything is being given away! There are three winners: one to receive the CoverUp Die: Stitched Clouds and Angel Pets Stamp Set and Angel Pets Dies, and two more winners will each get one of the new You Will Never Regret Being Kind and Be the Reason Someone Smiles Today Stamp Sets. Beautiful cards! Especially love the simple but elegant treatment of the 'Smile' card. Just fabulous cards Karen. Love the Nuvo drops on this card. Beautiful! Karen , these projects are terrific!!!! I love the background you created with the Stitched Clouds and how it looks so watery and wonderful. Love your sentiment card too. It's so bold and perfect. That sentiment really pops out with that bold graphic black and white design! Love the tiny embellishments too! This would be a perfect card for someone who lost their pet. I love how you did the cloud background for your little pet and the addition of the rainbow! Perfect! I love the doggie card, and I also love the small punches of color on your second one. Beautiful! so happy to be hopping along with you guys! I love your sweet cards...adorable! Love the sweet puppy and great idea for the sentiment. 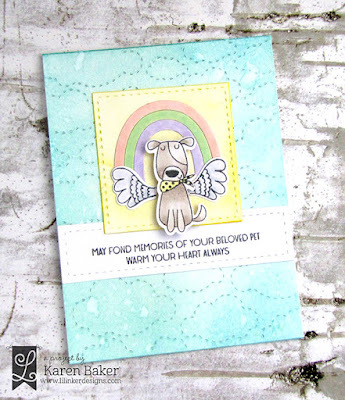 I like the rainbow and cloud background on the dog card and the Nuvo drops on the sentiment card. Love the cloud die, for multiple types of cards, but the clouds would be perfect for an angel pet. Beautiful cards. Love the CAS 2nd card with just the right amount of color added with the nuvo drops. Oh that looks so cool with the Nuvo drops! Ive been picking some different colours up now and then and I love them! I love both cards! The Nuvo Drops are the perfect accent to that gorgeous sentiment! Awesome cards! Love that sweet angel pup! And the big sentiment stamps are fabulous! Looks great in black with just the colored drops for embellishment! The angel pet card is adorable. The monochrome large sentiment card is great. The colorful Nuvo drops are just the perfect touch. Oh beautiful work with this mini release! Love your black and white card! Love love love your angel pets card! The simple black sentiment embellished with the colored drops is Stunning! Your angel pet card is the sweetest, and the black and white with the pop of color is amazing! 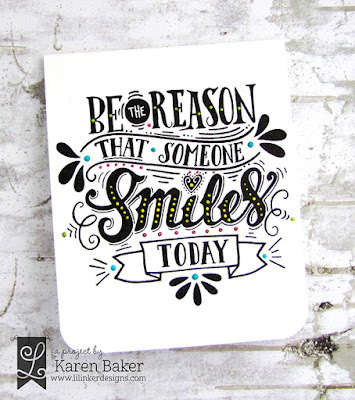 I love the clean simplicity of the Be the Reason card! And the Angel Pets card just couldn't be sweeter! Wow! Your cards are simply adorable!!! I love these!!! The little dots of color are awesome! Karen, your Nuvo drops added just the right pops of color! Your Angel Pet card is do sweet. 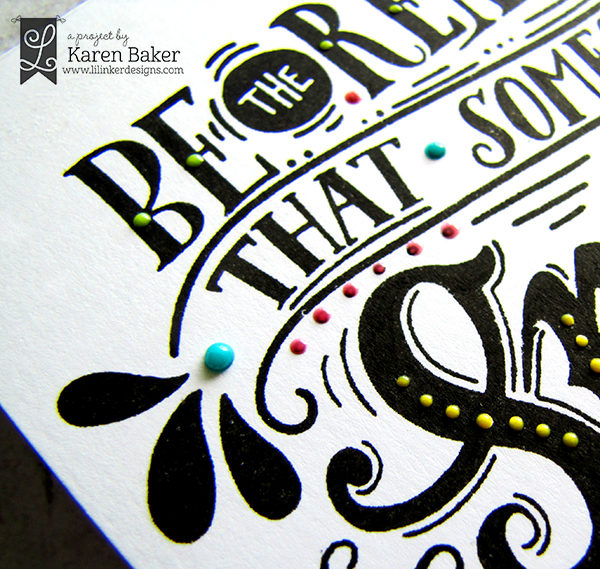 So cool with just the right addition of color with those dots! Your angel pets card is so totally sweet! And I love how you decorated the big sentiment card with all of those colorful Nuvo drops!!! Fabulous!!! Love the touch of Nuevo drops so bright and happy! These are both delightful Karen!! Great cards. I especially like the drops of colour on the last card. These are great! You are the Nuvo-drop-master! Hmmm I think someone is a little bit addicted to Nuvo drops! :D I love how you used them to decorate that fabulous sentiment. And the Angel Pets set will be my next Lil Inker purchase. I wish they were stamps we'd never need but if I have to make those cards these are lovely.